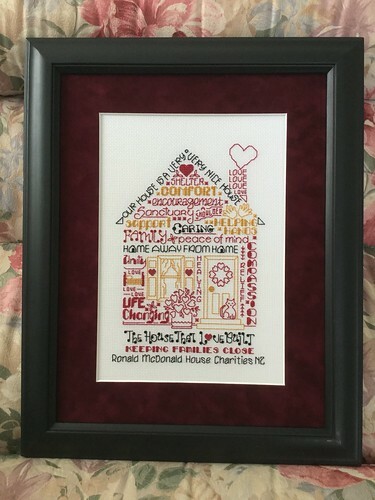 In May I joined a Facebook group to stitch a design by Ursula Michaels – this is a special design for the Ronald McDonald Houses, and the aim is to have a stitched version of this in every RMD House around the world. As there was a house in Auckland, I managed to time it with a visit home for my Mum’s 80th birthday, and did the framing while I was there. The house loved it, so it’s great to see it was received well. It certainly felt good to be part of this great initiative, that’s for sure! Anne S • This entry was posted in Uncategorized. Bookmark the permalink. was I supposed to see a sheep in that picture? My sister has been very ill and in the hospital since April. My family benefitted from a Romald McDonaldhouse and I would like to stitch this. How can I find the pattern? Where can I find the Ronald McDonald pattern? I stayed at one earlier this year when a family member was in the hospital and I would live to stitch it for them. It is in Glen’s Falls NY.